Pedaling the road: Who dares wins? 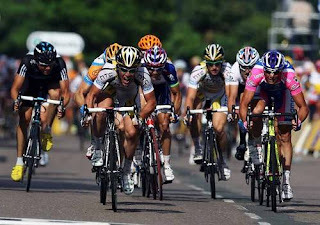 By taking a quick look at the tour de France rosters, it could seem like Cavendish will get an easy way to stage wins. It might be so, but there are several others who can be successful, if they have the guts and the DS have the courage to meet the current challenges with some genius tactics. As you all know, the point system has been upgraded before this years tour. The Inner Ring has a good post describing the details. It is rather strange that a successful sprinter like Cavendish, winning "every" sprint stage there is, ending up not winning the green jersey. People tend to forget that the Maillot vert is a point classification jersey, not necessarily a sprint jersey. Anyway, the ASO has decided to amp up the point competition this year, along with new points rule in the KOM-competition. The question remains; will the new system be to Cav's advantage? If the correlation between green jersey and stage winner is to be better, why increase the points in the intermediate sprint? I hope the battle for green will be as fierce as ever, and from my point of view, at least during the first couple of weeks, it will be. The first stages are more hilly than those in the end, creating opportunities for riders like Hushovd, Gilbert and Boasson Hagen (if he starts). What I think is great about the new point system, is that the teams really need to watch each other closely. Letting a break away get away will probably happen, but when 20 points are at risk, the excitement will be there. The aggressive riders can get a high ROI, while the ones only going for stage wins can struggle in the end. I'm getting ready, let's hope this tour will be a memorable one, for the right reasons. I think I may be just too old. Why is there ANY neccessity to tinker with the rules? It does not appear to me that tdf is losing popularity ( over and beyond the effect of doping scandals ), so just what IS the driver for change? PS I read Inner Ring post, and my comment above still stands. Cavendish to Team Sky - what to expect? The rainbow jersey - a season spoiler?